Many would ask what is the best place to take a ride on an electric scooter. 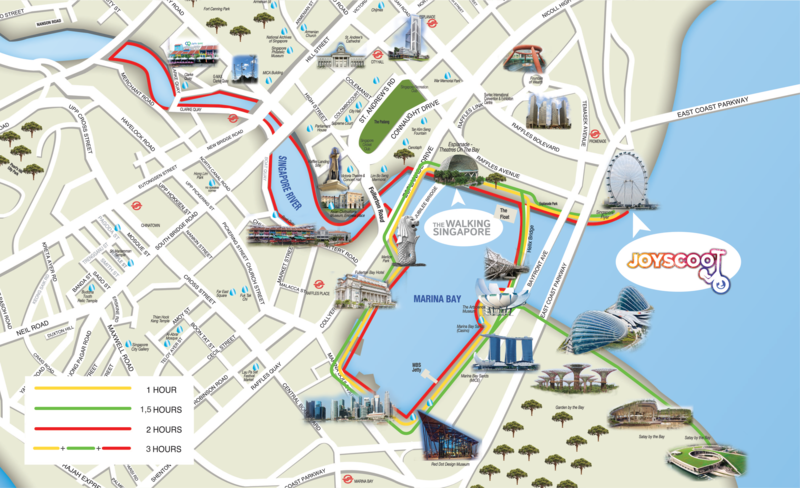 Our answer would be definite: Marina Bay and banks of Singapore River is by far the best place to ride e-scooters in Singapore! Together the shared paths here count to more than 10 kilometers of great quality roads and most beautiful scenery in Singapore. Romantic Tip: Try stopping at the Jubilee bridge next to esplanade during the sunset (around 7PM usually) and you will see how sun reflects in the Marina Bay Sands complex in all colors of rainbow. On the map below we have drawn 3 different paths and timing that it might take you to complete the paths leisurely driving your electric scooter or other personal mobility device. 12 Attractions to Visit in Marina Bay Singapore. Located at the Singapore Flyer is JoyScoot Scooter Rentals. Rent an e-scooter or hoverboard here and ride off to explore the rest of the Marina Bay and beyond. Singapore’s heat can be challenging so an electric scooter ride solves that problem allowing you to move from place to place without breaking a sweat. Riding an e-scooter or hoverboard does not require any experience because JoyScoot Scooter Rentals provides training before each ride. Visit more attractions in Marina Bay, Singapore on two wheels!